Precision valve balancing and a short valve stroke translate to low solenoid actuation force over a short solenoid air gap, resulting in small, high flow, low wattage fast response solenoid valves. Shock and vibration resistant. No adjustments and screws to vibrate loose. Stroke control across flat metallic surfaces eliminates the need for adjustments and prevents seat impacting. The resilient seats are separate from the stroke control, resulting in high resistance to damage from shock and vibration. Small size. 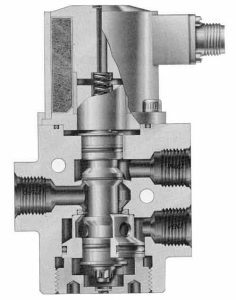 Smaller valves utilizing smaller solenoids are the result of the combination of precision pressure balancing and short valve stroke. Bubble-tight seat closure. Resilient seats provide “zero” leakage. Contamination tolerant seats. Resilient seats resist damage and provide high tolerance to contamination, allowing for particles to 1000 micron. Full flow and low pressure drop. The seats are located on the O.D. of the spool to provide low pressure drop. Precision pressure balanced seats and piston seals are on accurate and equal diameters, providing for low operating forces. Corrosion resistant metals are compatible with the fluid. Electron beam welded hermetically sealed solenoid construction. Underwater connector: Underwater connectors are usually on the top of the solenoid, for use in extreme ocean depth. Soft seat valve designs are very efficient and result in smaller solenoids. Hermetically sealed. Welded construction eliminates the problems associated with threads and O-rings. Corrosion resistant. Constructed of magnetic and non-magnetic stainless steels, eliminating the problems of electroplating and corrosion. Underwater connector. Underwater connectors, usually welded to the top of the solenoid, for use to extreme ocean depth.